Palmia Observatory: Going north to Fairbanks, Alaska; Aurora forecast looks good; Martinis look good; Darn Clouds; Physics with your cat! Going north to Fairbanks, Alaska; Aurora forecast looks good; Martinis look good; Darn Clouds; Physics with your cat! Well it is finally time to fly up north to Alaska and continue searching for the northern lights. 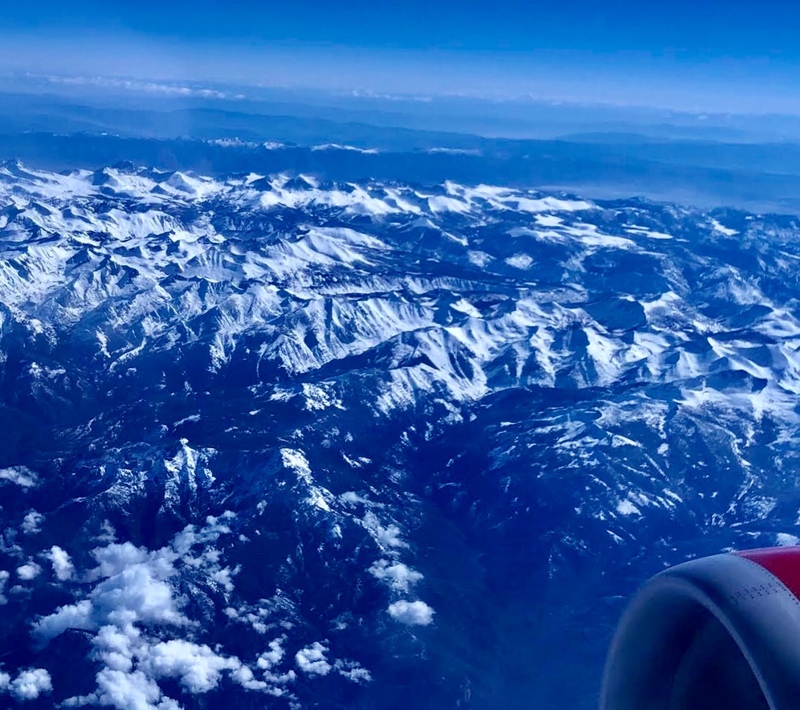 From OC to Seattle the snow covered mountain ranges provided a beautiful view from the airplane window. The aurora forecast for Fairbanks area was pretty good, so we were hopeful that the lights were going to be there and then all we needed was for the clouds to move away. 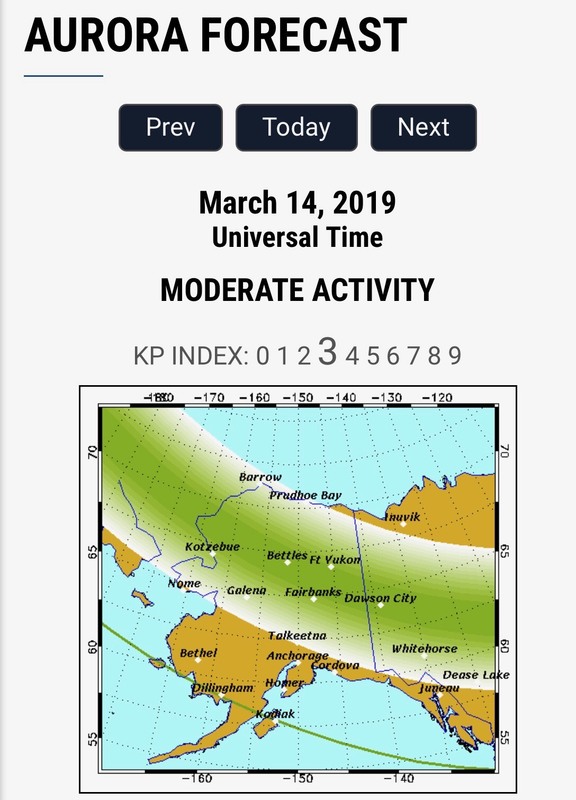 In the forecast below you can see the aurora oval, which is sort of centered on the north geomagnetic pole, passes right through Fairbanks. The weather forecast was showing partially cloudy to mostly cloudy, so we just had to hope for the best. So, when we got off the plane in Fairbanks the skies were mostly cloudy, but we remained hopeful. Our spirits were at least lifted a bit when we stopped for dinner at Pike’s Landing. We were certainly lucky to find Jessie there who took care of us. 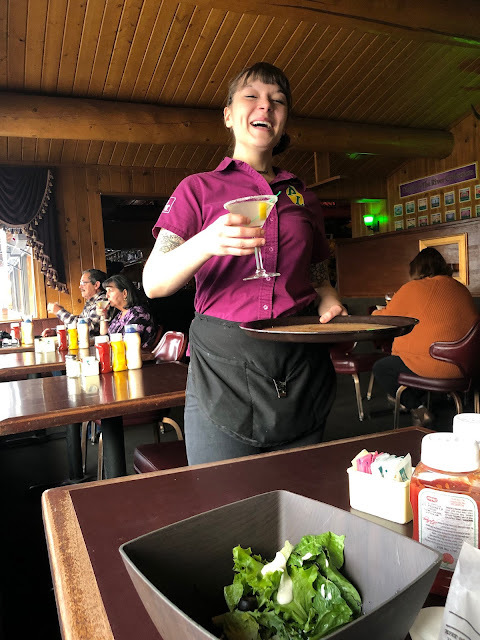 Now I always conduct a study of the quality of martinis wherever we go and I can say that Jessie served up some of the best ever. 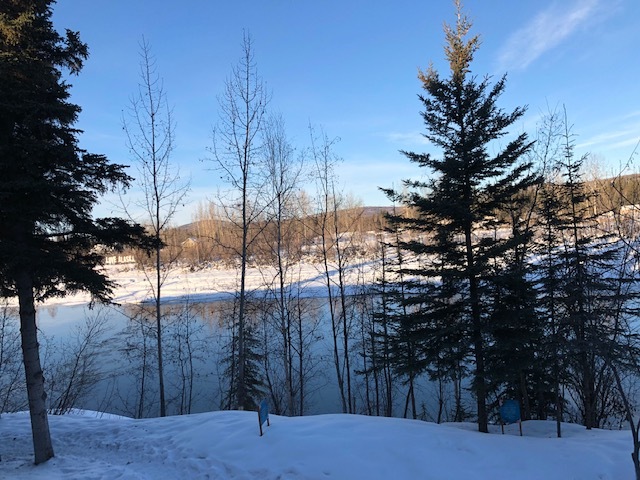 The food was great and the service was great and the view of the Chena River is great! Thanks for that, Jessie! So as the sun was going down the overcast skies became more and more filled in and even the moon was starting to fade away. 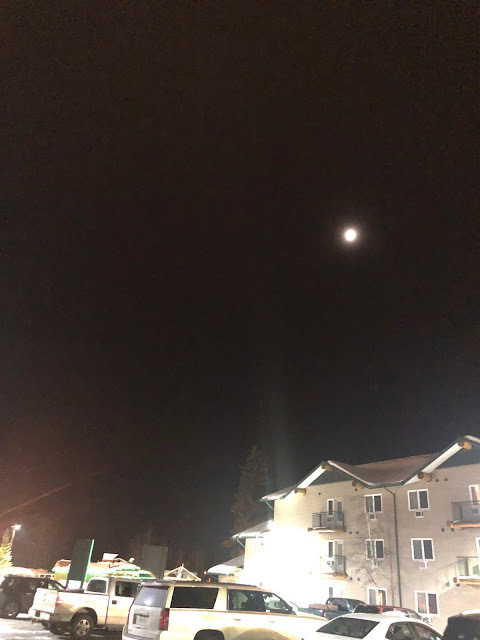 This IPhone image of the evening sky and moon and even darker forecast indicated that this night was just not going to be good for aurora viewing. The hotel parking lot was pretty well lit up, but at least you could see if the weather was going to cooperate or not. The next morning looked very good and the skies had a lot of blue showing among the scattered clouds. The China River in the foreground was thawing and was not frozen over and the warmer spring weather was going to be forming a lot of clouds. 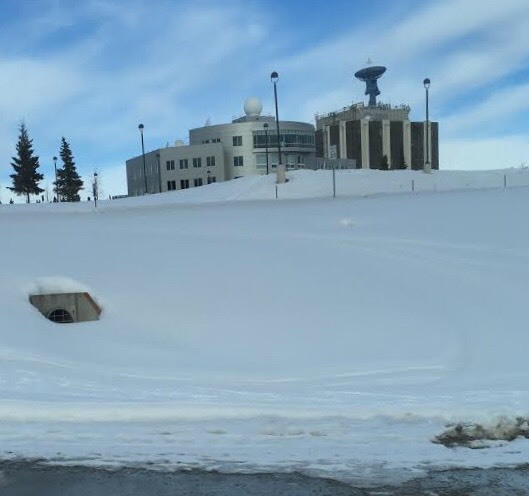 While we waited for nighttime, we had plenty of time to see some of the local sights, including a trip to the University of Alaska - Fairbanks campus. Here you can see on of the research buildings used to study the northern sky. We didn’t get into any of the laboratories but did see the Museum, located on campus. 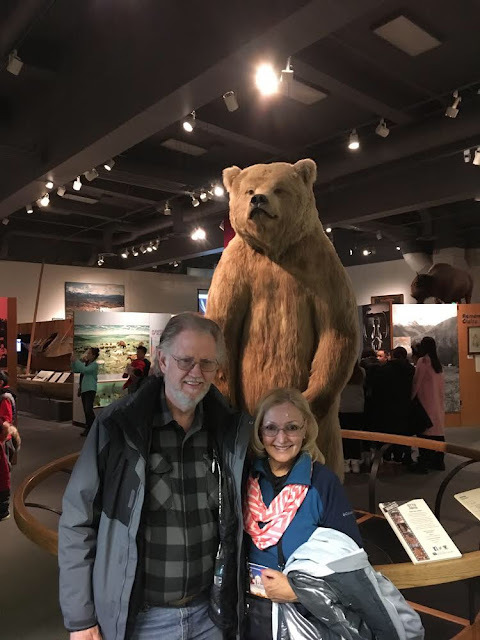 The museum provided treated exhibits of local history and we posed in front of a 9 foot, 1250 pound grizzly, best to meet this fellow in the museum and not out in the wild. So, as many astronomers do when the clouds roll in and spoil their viewing, they switch from studying stars and go to the bar. No, no, that is not what I did this time. I just took some 8 second exposures of the area surrounding our yurt. 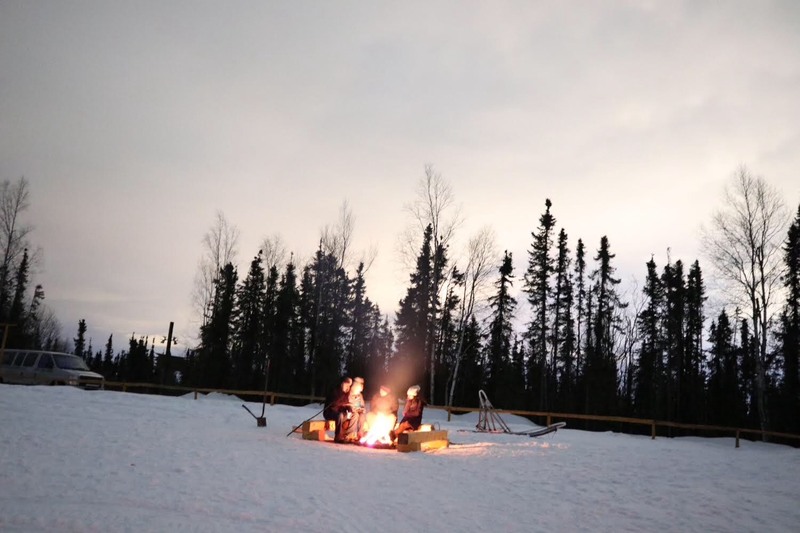 The image below shows the campfire where we sort of hung out part of the night and are Smore’s and waited. You can see the night sky is just completely overcast. There were times in the evening that one star would break through the clouds. There were a couple of time that I saw four stars in the whole sky. But they didn’t stay visible for long. No one saw any glimmer of the northern lights. 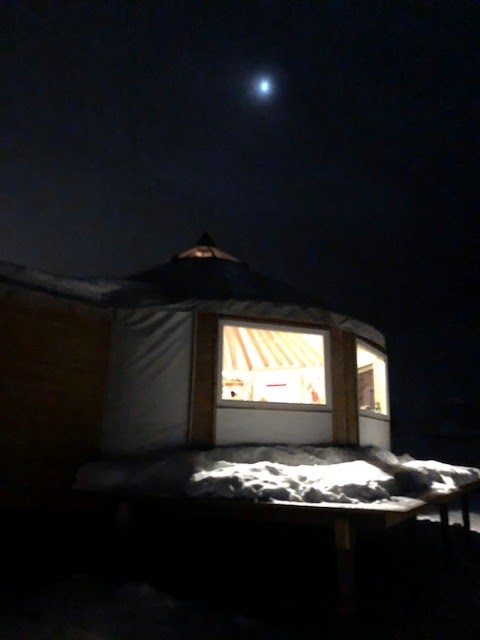 In the next image which is another 8 second exposure of the sky above our observing yurt. Nope, not going to see any northern lights though all of those clouds. So, at 4:00 AM we were done. Darn! We slept on quite late that day and only got out for a late brunch. We continued scanning all the forecasts to see if we should schedule our next all night viewing program. Hmm, the weather just does not seem to be cooperating. While we wait, we still some physics, that we learned about at Soapy Smiths Restaurant. A little newspaper handout on the table had a section on Feline Physics Laws.” I don't know about your feline, but our very own, Astronomer Assistant, Willow, also follows her own law of attraction in that if I am in a hurry to type some response up on the computer, she knows to purr up against me and get in between my hands and the keyboard, until she tires of the attention, which seems to hardly ever happen!